My summer of seafood continues. 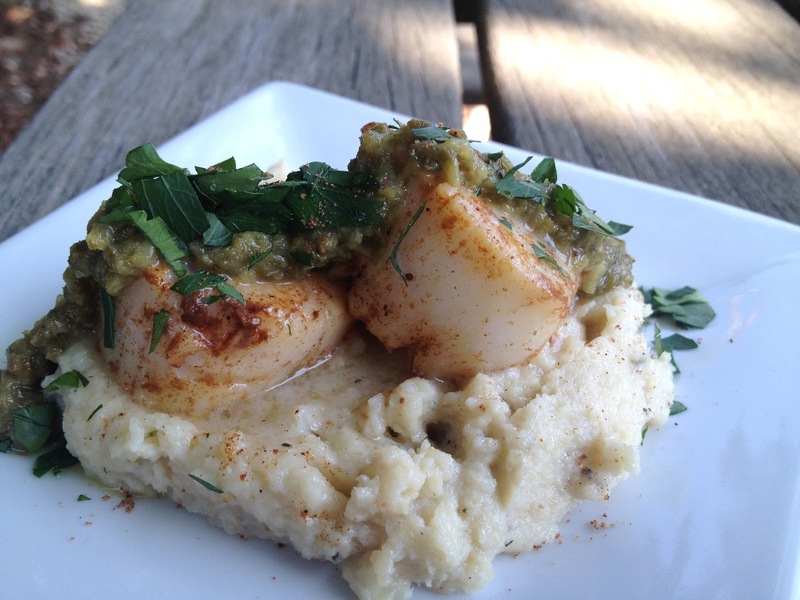 This past dinner at Tate's Kitchen featured these buttery, pan seared scallops served on a bed of roasted cauliflower puree with a golden raisin and caper sauce. Yikes that is quite the mouthful when I say all of it out loud. Anyway, I got this idea from a very late night episode of Iron Chef - very late. One of the chefs made a cauliflower puree and this sauce and served both over some sort of fish. I knew I wanted to make scallops for the next dinner so I figured this would be a fun experiment! Yes, a rather pricey experiment, but why not right? Let's try something new! I hope you can give it a go. Here's the link since I've posted this before - but I'll do a quick review below. chop everything and spread out on a baking sheet. toss in 4 or 5 thyme sprigs. remove - carefully toss all this and add the cheese. back into the oven about 15 minutes - or just until the vegetables are tender. when ready - add all the cauliflower, a couple chunks of onion and 2 large garlic slices to the food processor. pulse 5 or 6 times. add 1/2 cup of the milk or cream. pulse a few more times and see if you like the consistency. add more cream as needed. all of this goes into a small saucepan. once it is simmering let it cook just until the raisins are plump. dump all of it into the food processor. pulse until you are happy with the consistency. add a few turns of salt and several turns of pepper. 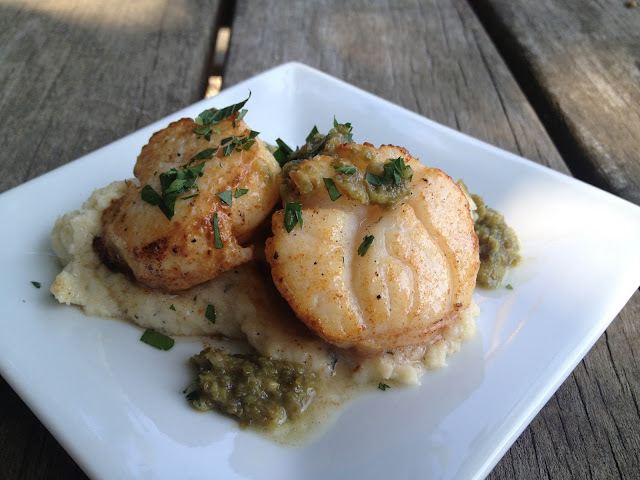 - Everything else needs to be done and pretty much ready to serve before you do scallops. They are definitely a cook and serve immediately type item. - Do not add too much butter and oil to the pan - again, you will not get the crispy browned sides. They are still tasty but they are now poached instead of seared (another horrible sentence...sorry) I only add a pat of butter then a tablespoon or so of oil and just add more butter and oil as needed. in a saucepan heat a tablespoon of butter and a tablespoon of olive oil until bubbly and browned. sugared side first - gently lay the scallops in the pan - no one should be touching. if you purchased the large scallops they will be ready to flip in two or three minutes - as soon as you see a lovely caramel color forming around the edges. flip and cook the second side - adding a little more butter if needed. little cauliflower puree on the plate. drizzle with the raisin caper sauce. garnish with some fresh parsley and a lemon wedge if desired.